"Never use more than 1 quart of fruit. Only use fresh fruit for this recipe. Any variation will work! 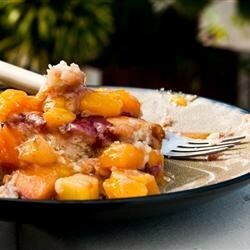 I usually do use sweetened peaches and lightly sugared berries, but this is optional. Serve warm with cream, ice cream, or whipped cream." An awesome easy recipe. My first attempt came out even better than I thought it would. I almost ate the whole pan myself !